This is yet another guide in my series of guides to get you the most out of your torrent downloads. Iâ€™ve already covered alternative trackers and patching your half open connection limit. These techniques can do wonders for you but youâ€™d still be missing out on some much needed bits if you havenâ€™t optimized your connection settings. Most of the optimizations rely on the maximum upload limit you have set. I would be using uTorrent as an example for this article, but everything also applies to other clients too including BitTorrent and Azureus. Youâ€™d also need to know your connections actual upload speed. You can make use of this tool to get an idea of maximum upload and download speeds. I recommend that you stop all other internet activity before running this test. It also helps to run the test a number of times and take an average of the results, because they arenâ€™t that accurate in calculating speeds and many factors can affect them. About five or six runs should be enough. Once youâ€™re satisfied that the said speed is indeed the maximum for your connection, note the number, close your browser and take out your calculator (Windows has one too you know). 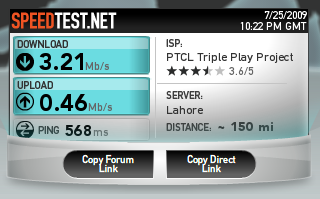 The speeds you received from the speed tests are in Mb/s while most torrent clients have settings in kB/s. There is a difference between the capital B and the small b. The former is for Bytes and the later stands for Bits. To convert Bits into Bytes, we divide them by 8. So lets get started with the math now. So we have 58 kB/s as our maximum upload rate. Note that this just an example Iâ€™m using. Youâ€™re speeds would definitely differ. Now that we have a base number, lets start optimizing our settings. Click on Options > Preferences in uTorrent and click the Bandwidth node. Most people have different arguments when it comes to download rates. Setting it to unlimited (0) means that you give full bandwidth to your downloads. This may slow down youâ€™re web browsing experience however. In general a value between 90% and 100% of your total download speed is ok.
As for me, Iâ€™ve set mine to unlimited. This is one setting that works differently for everyone depending on your connection. As for me, setting it to ten times my upload speed worked like a charm. Note that you should experiment with your number till you find a sweet spot. The maximum number of peers connected per torrent is a tricky one. Setting it too high or too low would hamper your speeds. From my experience, setting it to 1.2 times your upload speeds works best. One thing you should always keep in mind, you would get best speed for torrents that have the best Seeder to Peer ratio. Its almost always impossible to max out your connections download speed when downloading from a torrent network. So if you are getting around 80% of your total download speeds in a well seeded torrent, then you are doing pretty good. I recommend you subscribe to our blog for more tips and tricks on tech stuff. Ah thanks for the tip. I’ve updated the article. Ran 37 queries in 0.232 seconds.